The snow outside is snowly falling reminding of the comming Christmas and bringing holiday mood. 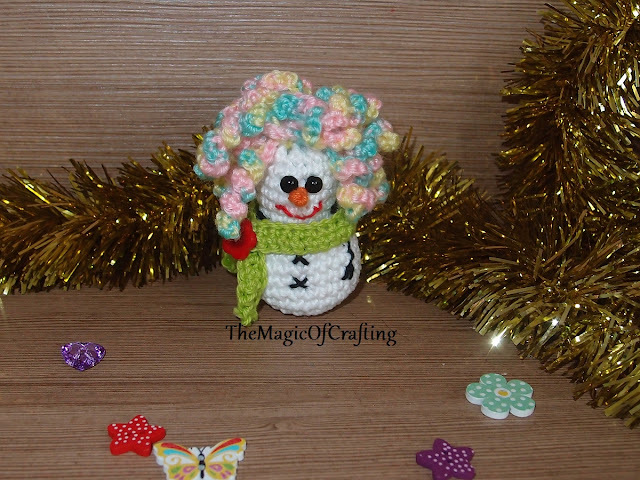 It is the perfect day to stay at warm in home and make more Christmas decoration. Don't lose this pattern. Add it to your Ravelry queue here. Round 1: Start with mc and sc 8 in the magic circle. The down part is made, fill it with amigurumi stuffing. Add eyes, fill with filling. The body is made. Do not close the head yet. Hair: Join yarn for the hair and ch 16, sc in second st from hook, 2 sc in each chain, ss in the same st where you started the chain. Repeat one more time but ss in the next st.
Repeat for each of the next 3 st.
You will have 8 curls done. 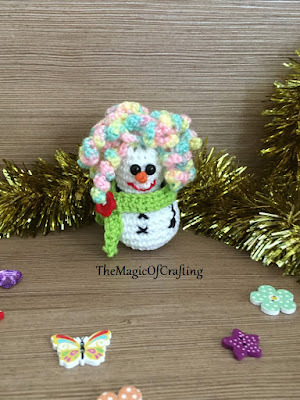 Now make one more row of curls only on the back part of the snowgirl - I have added 8 more randomly spread. Nose: With orange ch 2, ss in the second st from hook, attach the nose just below the eyes. 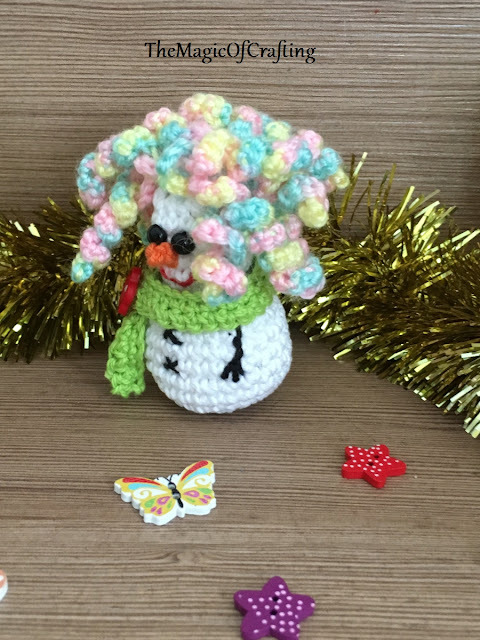 You may close the top of the head now - just sew what is left from the hole with white or the hair color yarn. Scarf: Ch 40, sc in the second ch from hook, sc in each chain back. Ch 1 and turn, sc in each st. The rest part is sewn. Sew the mouth with red yarn - it may take few tries if you don't have much experience (just don't give up). Make the buttons with black yarn in the form of cross, then sew the arms. Finally put the scarf on and sew it with a button. Happy holidays! If you like my patterns check all of them in Ravelry.